If you’ve ever dreamt of travelling across India – experiencing the delicious food, the ancient art and architecture, and the beautiful culture – then you’ve probably spent a lot of time imagining what it would be like to see the amazing sights you’ve found online for yourself. 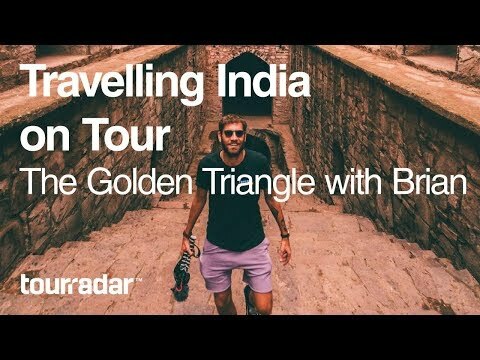 Today, join Brian as he explores the Golden Triangle, one of India’s best tour routes, and takes you along with him! If you can’t make it to India just yet, this is the next best thing. The three points of the Golden Triangle are Delhi, Agra, and Jaipur. Over a course of about 720 kilometres, travellers are treated to views of stunning cities, untouched natural beauty, and the full range of India’s landscape. It’s the perfect way to see many parts of India in a shorter amount of time! Delhi, the national capital of India, has been continuously inhabited from the 6th century BC! An area with that much history has so much to offer travellers, from the ancient to the extremely modern. Visit Humayun’s Tomb, explore The Red Fort, or climb the five stories of Qutb Minar for a view of it all. Delhi is a fast-paced, busy city, but don’t be overwhelmed! Explore at your own pace and you’ll have an amazing time. Agra is a hugely popular tourist destination, thanks to one main attraction: the iconic Taj Mahal! This 17-hectare complex, including the main tomb, mosque, and a guest house, is the final resting place of Mumtaz Mahal, the favourite wife of Shah Jahan, who reigned from 1628 to 1658. Interestingly, the tomb of the builder, Shah Jahan, is also located on the grounds! Millions of visitors flock to the Taj Mahal every year, and with its white marble splendour, it’s very easy to see why. Finally, Jaipur rounds out the Golden Triangle. Known as “The Pink City,” the area’s stunning architecture will bring out the shutterbug in you! Take a stroll through one of the many traditional shops, and find the perfect antique or handmade souvenir to bring home with you. A visit to India is always something special, but following the Golden Triangle route means you’ll truly be able to see this amazing country. Whether you’re planning your trip right now, or still in the daydreaming phase, why not head to TourRadar and check out a few Golden Triangle tours for yourself?